If the Devil has all the best music, then how great must a band named Satan be? Answer: pretty damn great. 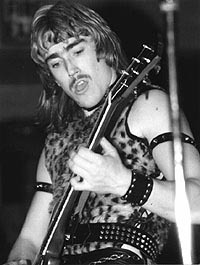 The NWOBHM was one of the most incredibly fertile periods in metal history, but it was littered with the bones of awesome bands that just couldn't break through to the success they deserved. It's not accurate to say Satan didn't "break through", but surely they deserved more success. They have been a cult favorite of knowledgeable rivet heads for more than 30 years now and their debut album "Court In The Act" is considered a cornerstone of British metal history. If you've never heard these guys, then you're in for a real treat. Imagine early Iron Maiden and Diamond Head with more speed and anger and you've got a good idea of what their core sound is. Speed metal with class and intelligence. The band went through the usual line-up changes and also changed names several times to avoid the stigma of being "Satan" (Blind Fury and Pariah were two of their other names) but now in 2013, they've embraced who they are whole heartedly, and what's more, they've gotten the "Court In The Act" band back together and unleashed an incredibly powerful "comeback" with "Life Sentence". This new record is easily one of the best records of 2013 and equals if not surpasses Satan's earlier work. WORMWOOD CHRONICLES:. Hail to SATAN! “Life Sentence” is a real stunner that compares with any metal album in the current scene. How long has this been in the making? STEVE RAMSEY: Thank you. About a year and a half in all. WC: Are the songs relatively recent or do the ideas for some of them date back to the glory days of the band? SR: The material is all new. WC: Do the times of “Court In The Act” and even “Suspended Sentence” seem distant now or are they just like yesterday? SR: When we reformed the band to play the Keep it True festival in Germany 2011 it seemed a long time ago, but when we started performing and writing together again it seems just like yesterday. WC: How much of a chore was it to put the “Court In the Act” lineup back together? Have you guys always been in contact through the years? SR: Yes, we had kept in touch. The first reunion show we played was without Sean our drummer at the Wacken festival in 2005. He was unable to play the stuff after a knee injury so we had Phil Brewis who was Blitzkrieg's drummer at the time to stand in. That's why we didn't do any more shows or even contemplate writing new material until Sean was able to play with us again. WC: Has the songwriting process changed from the old days? What have you learned in the interim that has changed how you do things? SR: It was quite similar to how we used to write in the old days. Russ took the lead and wrote most of the music with myself and lyrics were again mainly Russ with Brian and myself helping out. The band add their individuality to the main ideas instrumentally, it's very much team work in the end. We are more experienced musicians now and had to take a step back and write what we thought would be our second album with the original lineup. There were a few little rules to adhere to like not much odd time stuff as we wouldn't have done that back then. WC: I am amazed at how strong Brian’s voice is on “Life Sentence”. This man has been singing metal since the 70’s…what is his secret? SR: To be honest so were we. I think it's his best ever recording. Got no idea what his secret is. Maybe it's just in his blood! WC: Are you drawn to write about the same themes in 2013 as in the 1980’s? It certainly seems that you are keeping the “court” or “legal” theme of the band running. SR: Yes, it was important to us to keep the theme of injustice in the world running through the lyrics and visually through the artwork. We're called Satan but there has never been any songs about the occult or featuring the devil etc. Theyr'e about the evil that mankind bring upon themselves. WC: Lyrically, “Life Sentence” seems to be rather bleak. Is there room for hope in Satan’s music or do you think the clock is running down on mankind? SR: Mainly we write lyrics with themes that reflect the aggression in the music. We're not trying to deliver any message to the fans. It's about looking at history and events that should really not have occurred. WC: Technology has changed drastically since Satan first arose. What are the biggest advantages and disadvantages to the way things are done today? SR: The internet has given underground music a greater voice ,we think. That's why fans are getting back into our style of music ,for instance. They are less force fed by magazines that rely on the bigger labels advertising revenue. Of course the downside is that everyone can access your music for free which makes it more difficult for bands to keep their heads above water financially. WC: Is there one song in particular on the new album that you are most proud of or that you think sums up the band? SR: We are very happy with the way all of the songs have come out. We all have our own favourites in the band which are different from each other. I think it's very much a collection of work and not a few good songs and the rest fillers like a lot of albums seem to sound like nowadays. WC: “Personal Demons” to me seems to have the most old school, NWOBHM sound. Is this a very personal song taken from experience? SR: Yes, it's a blues based riff that threads the song together. Lyrically we like the audience to read what they think themselves about the content of the song. WC: Have you guys played live much since the reformation? If so, did you have to shake off any rust or did things immediately click for you? SR: We've played a few shows now and didn't have any problem getting back into the swing of being Satan again. We knew from the first rehearsal back together that we still had the same magic if you like to call it as a band. WC: Another British band that’s made a great comeback recently is Hell. I think Satan playing a show with Hell would be a natural! How about it? SR: The idea has already been spoken about in various circles. I think it would be more strange if it didn't happen somewhere down the line. Festival promoters are sure to see the value in that. WC: The band has gotten flack over the years for its name. Surely the comparison to black metal bands have gotten tiresome. Was there any thought of changing it? SR: Well, our history shows that we did indeed change the name a couple of times which we now think sort of held us back a bit. It seems more acceptable now that it's just the name of a metal band and nothing more. WC: Do you foresee more albums in Satan’s future….without a decade’s wait between them? SR: We haven't made any stone wall plans as yet but if the interest is there then why not? We really enjoyed making this one. SR: It would depend what agenda there would be. If it was to entertain myself it would be all comedians! Maybe Laurel and Hardy and Richard Pryor! WC: What was the last release you got just because you wanted to hear the band? SR: I think the last album I bought was "Insects" by Breed 77. Flamenco metal. WC: What was the last gig you caught because you wanted to see the band? SR:The last ticket for a show I bought was for It Bites in a small club in Newcastle a year or so ago. WC: In the history of Satan, has there ever been any “Spinal Tap” moment where things went wrong that you could share with our fans? SR: There's been many. At one show in the early days, it was the Kiss Of Death lineup in around 1981, we played a show in a pub in Newcastle where we decided it was safe to set off loads of pyros and subsequently they set fire to the ceiling tiles which were falling all around us on stage as we played. WC: Any last words to the faithful? SR: Hope to be able to come and play a show near you all at some point in the next year.